U.S. secretary of education Arne Duncan and Netflix founder and CEO Reed Hastings just gave a huge shot in the arm to the Education Tech community this morning, with an OpEd column in The Wall Street Journal this morning. They explain how some new ideas can boost student achievement in the U.S., which is stagnating compared to economic competitors like China and India. Imagine, though, an online high-school physics course that uses videogame graphics power to teach atomic interactions, or a second-grade online math curriculum that automatically adapts to individual students’ levels of knowledge. All of this will happen. The only question is: Will the U.S. lead the effort or will we follow other countries? In the past two decades, technology has revolutionized the way Americans communicate, get news, socialize and conduct business. But technology has yet to transform our classrooms. 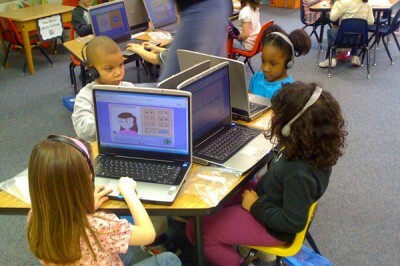 At its full potential, technology could personalize and accelerate instruction for students of all educational levels. And it could provide equitable access to a world-class education for millions of students stuck attending substandard schools in cities, remote rural regions, and tribal reservations. They point to South Korea as a country that’s outperforming the U.S. with 21st-century classrooms. 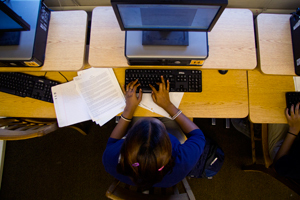 It plans to get rid of textbooks and replace them with digital products by 2015. They point to countries like Uruguay that give a computer to each student. It is no secret that advances in educational technology have been hailed as breakthroughs in the past, only to disappoint. Too often, the market for educational technology has been inefficient and fragmented. The nation’s 14,000 school districts, more than a few of which have byzantine procurement systems, have been inefficient consumers and have failed to drive consistent demand. And a robust R&D base for improving and refining educational technology has been sadly lacking. To help remedy those gaps, the Department of Education is launching a unique public-private partnership called Digital Promise. Digital Promise is a bipartisan initiative that will be sustained primarily by the private sector. It was created by a law signed by President George W. Bush. Federal seed money will fund the program’s start-up, but it will be overseen by a board that includes business executives—such as John Morgridge, the chairman emeritus of Cisco, and Irwin Jacobs, co-founder of Qualcomm—who will work with researchers, educators and other private-sector leaders. They say the Digital Promise aims to find breakthrough technologies that will transform teaching and learning. They want to build a market for education technology. They point out that education currently spends less than .2% on research and development. To spur more R&D, Digital Promise can promote the rapid testing of new products modeled after Internet companies such as Netflix, which use low-cost experimentation to improve their products. Thankfully, educational technologies already have the potential to quickly identify what works to boost learning and refine tools that need improvement. Learning faster what’s working and what’s not. Internet startups do rapid evaluations of their sites, running test after test to continually improve their services. When it comes to education, R&D cycles can take years, producing results that are out of date the minute they’re released. Digital Promise will work with researchers and entrepreneurs to develop new approaches for rapidly evaluating new products. Today’s event will be livestreamed at 10:00 a.m. ET www.whitehouse.gov/live. For further details about Digital Promise and related initiatives please visit www.digitalpromise.org and http://www.whitehouse.gov/the-press-office/2011/09/15/fact-sheet-digital-promise-initiative.